Mies’ story begins in Berlin, where his architecture career first took off in the years following World War I, a time of transition in the artistic and industrial worlds in Europe. 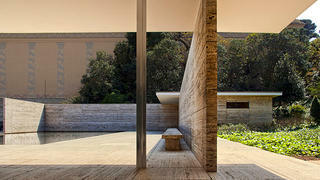 While in Germany, he designed one of his most acclaimed buildings, the Barcelona Pavilion (1929) in Barcelona, Spain, for the 1929 International Exposition. Built without ornamentation and with a simplicity in form and material (glass, steel, concrete, and marble), some critics consider it the most important building Mies ever created. 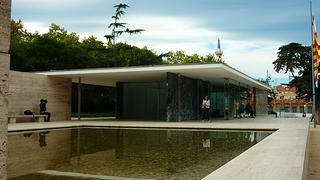 The Barcelona Pavilion was supposed to be a temporary exhibit, and was torn down less than a year after its construction. However, it was reconstructed in 1986. 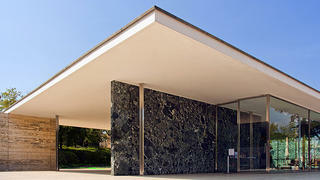 Mies used materials like red onyx, travertine, and marble. Mies wanted the Pavilion to be a tranquil site for visitors. But with the rise of the Nazi empire, the sun set on Mies’ first architectural career in Germany. He served as the final director of the Bauhaus school until pressure from the Nazis forced it to close. Not yet speaking a word of English, he immigrated to the United States in the late 1930s, where his talent soon earned him the position of director of architecture at the Armour Institute in Chicago (now the Illinois Institute of Technology). In fact, Frank Lloyd Wright, who notoriously admired few living architects, introduced Mies to the crowd during a reception, saying “I admire him as an architect, respect and love him as a man.” Few could expect higher praise from Wright. What makes Mies’ sleek high rises and polished residences so captivating? He once famously said that “God is in the details.” You may have also heard the adage “less is more,” which was another popular turn of phrase of his. His focus on materials and space, with intense attention to the little things, helped launch a movement of postwar Modernism in the United States. There is a sense of continuity among his structures, both residential and commercial. 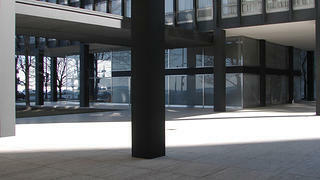 Mies didn’t approach each building as separate from his other creations. Rather, he planned his buildings by focusing on the materiality and possibilities of steel, glass, and concrete, while attempting to create a sense of space and height. By the end of Mies’ lifetime, he had overcome this problem by producing refined clear-span building designs, as seen in plans for the unbuilt Chicago Convention Hall (1953-1954) and later structures like the Federal Center in Chicago (1959-1974). 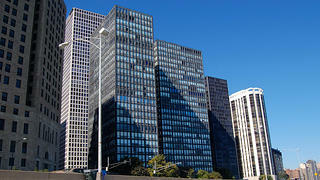 The glass-and-steel 860-880 Lake Shore Drive apartments are considered foremost examples of the International Style. The travertine plaza creates space beneath the building and a sense of human scale. Mies called his architectural style “skin and bones” because of his use of industrial materials like glass and steel joined on one plane, creating an exoskeleton, and the transparency of his buildings, thanks to his use of glass. His buildings look light on their feet. Think of the Farnsworth House (a National Trust Historic Site built in 1951), for example, and you get the idea. You can see straight through the rectilinear building, with concrete I-beams delicately holding the concrete-slab structure off the ground. In 1920s drawings of his earliest plans of glass skyscrapers, you get a sense of how he imagined glass could be utilized: He wanted the structures to transform throughout the day depending on the way sunlight would strike the panes. photo by: Ken OHYAMA/Flickr/CC BY-SA 2. 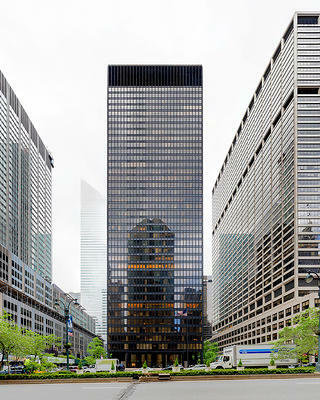 The Seagram Building was one of the earliest skyscrapers to incorporate a pedestrian plaza. Architecture critic Paul Goldberger explained in a 2001 panel that Mies’ understanding of space “was made for human society.” Mies never used the word “humanism” to describe this, but “people feel right inside a Miesian space. They don’t feel it excludes them.” He accomplished this through the feeling of open space inside his buildings due to clear-span construction and the use of pavilions in his commercial structures. Most people still appreciate how the architect revolutionized so many of America’s city skylines—Chicago wouldn’t be the same without his Lake Shore Drive apartments (1951), and it’s hard to imagine New York City without the Seagram Building. His vision of glass, steel, and concrete, of technology and art working together, transformed the mid-20th-century (and later) architectural landscape, cementing Mies as an avant-garde visionary.